Once a student has some pattern experience at El Monte, I find it a nice change of pace to go to a different airport. Brackett is usually my first destination; it’s about 13 miles east of El Monte (detailed KPOC information). Take a look at the LAX TAC too. During run-up, on the step that says “Radios-set”, we will switch to the El Monte tower frequency on Comm 1 and set the KPOC tower frequency (118.20) as the standby. We will also set the Brackett ATIS (124.4) as the primary on Comm 2. This gives us fewer things we have to worry about doing while we are flying. We always try to anticipate what we can do while we are less busy that will reduce our workload during busier times. We’ll depart east. 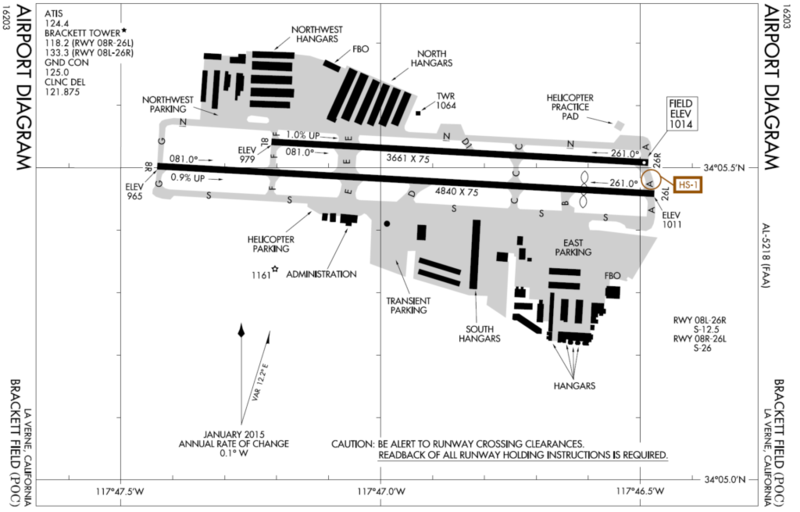 If runway 19 is in use, we can request an eastbound or left crosswind departure. A simple method of navigation is to follow the 10 freeway, keeping it off the pilot’s left side. I will commonly fly at 2300′ or 2500′ MSL on the way to Brackett. This is a good chance to practice leveling off for cruise by lowering the nose, reducing power after accelerating to a cruise speed, and continuing to adjust pitch and trim to maintain a level altitude (as opposed to a level off in the pattern, where it desirable not to speed up too much). Once we’re given a frequency change from El Monte, we’ll listen to the ATIS for Brackett and then call Brackett tower inbound for landing; I like to call when we are at least 6 miles southwest, to ensure we call well before we enter their airspace. Usually the winds favor runway 26L (two six left) and 26R (two six right) for takeoffs and landings. We’ll plan for a 45 degree entry for left traffic to runway 26L. We’ll aim for “Kellogg” (you’ll see this marked on the chart – it is the intersection of the 10 and 57 freeways). At Brackett, the TPA is 2014 feet, but we’ll round that to 2000. You’ll also notice on the chart a symbol for a VOR just south of the airport. This is the Pomona VOR (POM). This is a radio navigation aid, but the equipment is easy to see and gives a good target for where we will turn to the downwind leg. Brackett has two parallel runways. This allows two airplanes to takeoff or land at the same time. As a result we want to make sure if we are landing on 26L that we don’t overshoot our turn from base to final and potentially get into conflict with airplanes who might be using 26R. If we land on 26L we will get off the runway to the left. There will be the same markings (2 solid, 2 dashed lines) to tell us when we are “clear” of the runway, but there may also be a dashed line to tell us to stop before we get to the parallel taxiway. That’s where we will stop to do our cleanup and call the ground controller. This is more standard at airports than the situation at El Monte where we are already on the parallel taxiway when we are clear of the runway. Because there are two possible runways in use at the same time, it’s very important that we acknowledge the runway assignment. For example, we might be told “54678 cleared for the option 26L” and we need to say “cleared for the option, 26L, 678”. Brackett also has a “noise abatement procedure” when departing on 26L or 26R. They are trying to keep airplanes from flying directly over houses west of the airport. If traffic and safety allow, they prefer that we make a slight left turn at the end of the runway and fly over the lake, rather than the houses. This means that our upwind leg is angled, so our crosswind leg is usually very short before we turn to the downwind leg. We will do pattern work at Brackett; initially we will do full stop landings. If the landings are going well – staying on the centerline, good distance and so forth, then we might do “touch and go” landings. To do a touch and go, we have to be “cleared for the option” or “cleared for touch and go”, not “cleared to land”. For a touch and go, after landing, you keep the airplane on the runway centerline and retract the flaps (I will handle this initially) and then accelerate to take off again. I will only do a touch and go if we are ready to takeoff again with at least 2000′ of runway left. When we are ready to depart Brackett and return to El Monte, we will ask for a “straight out departure”. We will climb to 2500′ and remain well north of the 10 freeway. Once we have received a frequency change from Brackett, we’ll listen to the El Monte ATIS. 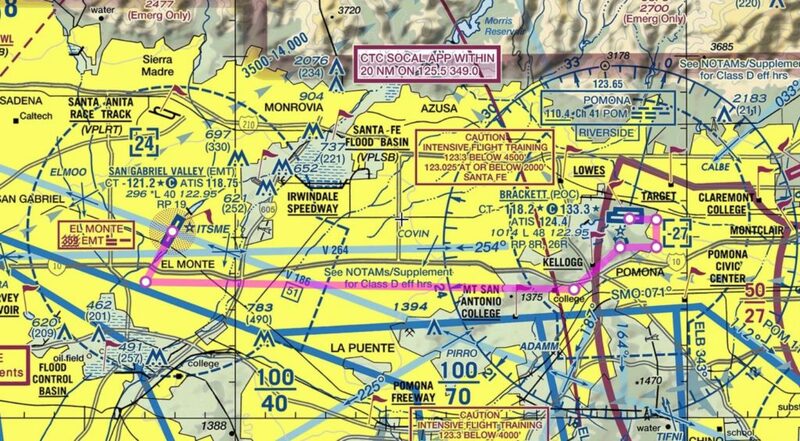 Because of the shape of El Monte’s airspace, we need to call at least 7 miles east of the airport. Depending on a number of factors (our exact position, traffic at EMT, and the preferences of the controller), we might be assigned “left traffic”, “fly direct to Irwindale Speedway and make a modified straight-in”, or “enter left base”. These all assume runway 19 is in use. Can you select a good point to aim for in each case to set up for the entry? Why 2300′ or 2500′? VFR cruising altitudes are even thousands + 500′ on westbound courses (e.g. 4500) and odd thousands + 500′ on eastbound (e.g. 5500). That rule only officially starts at 3000′ AGL though. This means there are no official altitudes below 3000′ AGL. We could climb to 3500’MSL on the way to Brackett, but on such a short flight, at best, you would climb and immediately descend (or maybe never even reach 3500). Also notice Ontario’s airspace starts just west of Brackett at 2700’MSL; by staying at 2500′ or below, we avoid the possibility of accidentally straying into their airspace. Why not lower than 2300′? – there is terrain along the route and 2300′ is as low as I feel comfortable flying there. This discussion gives a good illustration of many issues in flying; there is not a single right way to do something, there are alternatives and trade-offs that need to be weighed and you may feel a different answer is appropriate when you are a pilot.